Keraudrenia doesn’t have petals, says Grandma. 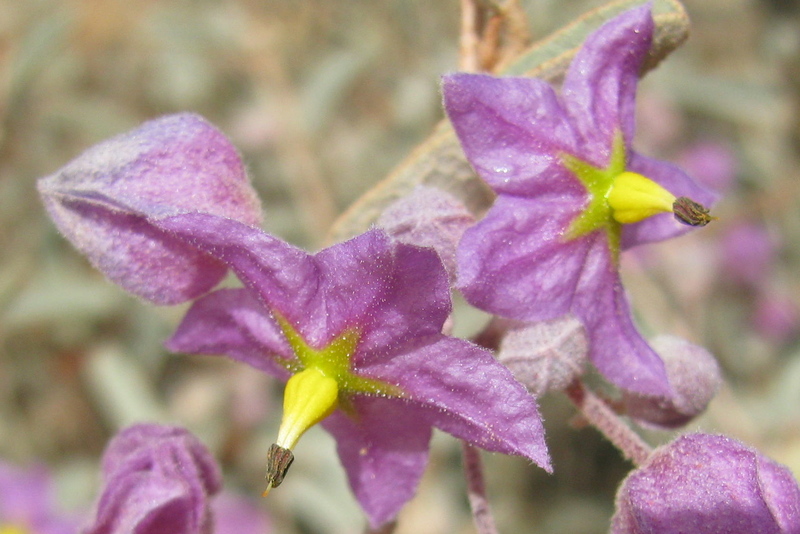 The purple parts of this flower are brightly coloured sepals that look like petals. On most flowers, sepals are green leaf-like outer parts that enclose and protect the flower while it is in bud. When the flower blooms, the sepals sit supportively beneath the opened petals. Sitting in the sand dunes with Keraudrenia, I opened myself, made a heart-to-heart connection, and waited. Nothing happened. No images, no feelings, no words. Nothing. Puzzled, I stepped back and decided to try again another time. On my second attempt, the same thing happened. I let go and moved on. Then one day, while doing a healing on a client, a presence shot into the room like a bee on steroids, hijacked my healing without saying a word and then, just as suddenly, was gone again. It was Keraudrenia. A week later the same thing happened during another healing. By this time I was starting to feel a little exasperated. I understood nothing about this flower, it would not talk to me, and yet it insisted on entering my space. Not knowing what else to do, I called Kathleen and asked for her opinion. Kathleen reminded me that flowers have personality strengths and weaknesses as we do. “Perhaps this flower has something to learn from you,” she suggested. This got me thinking. If Keraudrina had any obvious flaw, it was a lack of social skills. I knew enough about flower spirits to know Keraudrenia was probably reflecting something back to me about myself. Then a series of synchronistic events occurred, and I had a strong feeling they were all related. My first instinct was to brush this idea aside with a laugh. Me? Lonely? I don’t think so! Instead, I decided to sit with it for a while. Then I remembered a dance therapy session I had done with a friend earlier in the year. I had crawled into a small space towards the end of the dance. When it was time to stand up and come out of that space, I was paralysed by what felt like a memory from my childhood. It took all the strength I had to walk back across the dance floor to where my friend sat watching. She was the only person present, but it seemed as though a million eyes were watching me and none of them were friendly. I felt very alone. Everyone was judging me and rejecting me. I could feel and remember my childhood self deciding not to care. I will never need anyone ever again. This way I can be safe. A few days after I received the ‘loneliness’ text message, I noticed my father’s spirit energy seemed unusually strong around me. To get my attention he usually bombards me with special butterfly and bird experiences, but this time I could literally feel him following me around. It was quite unnerving. After a while, I sat down and turned to face him. “Okay Dad. I am listening. What is it?” His reply was not at all what I expected: When I was alive. I was lonely. I didn’t realise it at the time. I don’t want this to happen to you. This really surprised me. He did not come across as a lonely person, but then, neither do I. So now I am making more of an effort to connect with people and make time for them, even though I love spending time alone. When I am with people, I am slowing down and being more present with them, even though this makes me feel restless and unsettled. When Keraudrenia next visited me, it slowed down and warmed up, finally conveying a very brief image of itself entering the back of a closed throat chakra and opening it up.